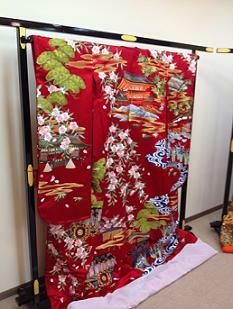 At “Oatsurae Salon”, you can find Kamigamo Shrine original kimonos including “shiromuku (all white kimono)” and “iro-uchikake (kimonos in colors)”. We, LST Tokyo staff, traveled to Kyoto the other day. Our purpose was to visit the newly opened “Oatsurae salon” next to our head office. We were so excited, as everyone had longed for the opening of it. “Wow!”, cheers arose from us naturally, as we entered the salon. An array of so many kimonos in the spacious room. This is exactly a place “to enjoy the process to create one’s wedding”, I totally understand and agreed the concept of this salon. In this place, brides, grooms and their family members will be thinking about the wedding ceremonies they are going to experience while they are selecting the costumes. Watching such scenes closely will be the great pleasure for us (planners) too. Having visited “Oatsurae salon”, I realized again that we would like to share the joy or worry of our clients and propose the unique wedding for each couple. I really hope to see many smiles in this newly opened space.